We take a look at market valuations, return patterns, and the health of the economy for clues about what might come next. The economy continues to show signs of strong growth. Friday’s August jobs report showed strength in new jobs and wages. Not only did job growth exceed expectation at 201,000 net new jobs, but incomes grew near a 5% annualized pace. Moreover, the quarterly data on output and productivity is encouraging, too. According to the Bureau of Labor Statistics, output rose 5% in the second quarter, with increased productivity jumping to 2.9%. Of course, we should not extrapolate too much from one quarter, but it is good to see some improvement in this key area. But what about the stock market? Is it already pricing in too much of a good thing? After all, it is hardly been a secret that things have been going well lately. We usually try to measure market expectations in a variety of ways, and there is no perfect answer. 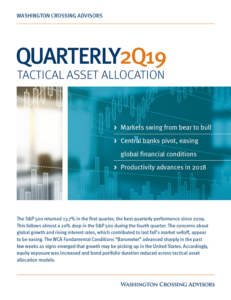 Growth expectations, risk appetite, and interest rates all play a role in determining stock prices, and each of these factors are always in flux. A crude proxy of value is the forward-looking price-to-earnings ratio based on expected S&P 500 earnings for the next 12 months by analysts. This ratio is currently 16.7x versus a 10-year average of 14.4x. By this measure, the stock market appears somewhat expensive, but not absurdly so. At the end of the 1990s bull run, by comparison, the S&P 500 traded at a much loftier 26x forward earnings. A different way to look at things is to look at this backwards. 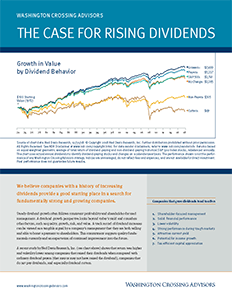 Following the principal that “trees don’t grow to the skies,” we can consider trends in past returns. When past returns are extraordinarily high or low, this could signal turning points. The chart below shows the trailing 10-year returns for the S&P Composite index from the early 1900s. 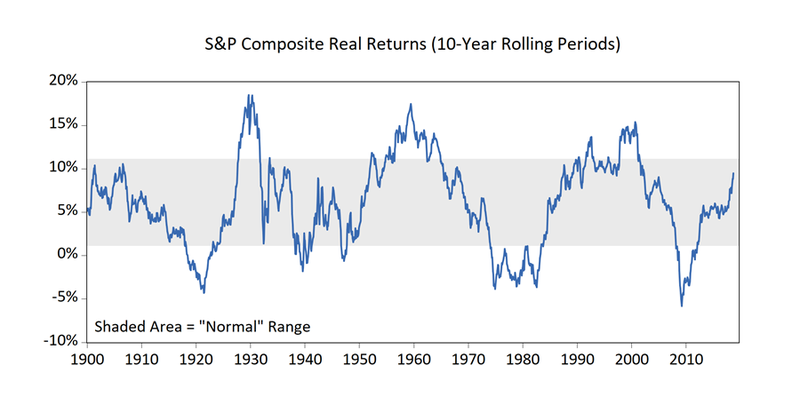 We’ve highlighted a “normal” range centered around a typical 6.1% average real (inflation-adjusted) return. Above and below this range are periods that were generally associated with extremes of optimism of pessimism. Note that today, we find ourselves within the normal range, but moving quickly toward the upper end. Similar to the price-earnings view, this suggests stocks may be rich, but not yet at extremes. With growth picking up after a long drought, the bull case for equities appears strong. As you can see, valuations for stocks are no longer low and this fact is weighing on our forward-looking return expectations. As of the end of last quarter, we estimated stocks were priced to return 3.5-4% over cash and 30-year U.S. Treasuries over the long-term. What could change this outlook? A significant hike in interest rates, a sharp change in market valuation, or some unforeseen shift in global growth are all concerns. For now, we continue to see good momentum in most of the data we follow and are making no tactical shifts at this time. Tactically managed portfolios remain tilted toward stocks over bonds; domestic over foreign; developed over emerging; and value over growth.